I’m spending some time during the summer break with Calvin using our Lego Read & Build sets. That’s the awesome thing about Legos right? They never get old! Also, look at sweet little Oscar in that video. Melts my heart! Originally posted July 2012. Oh LEGO you know just what to say. Being the huge LEGO fan that I am, I am really excited that Oscar (3.5) is finally starting to understand the concept of building something specific with the colorful bricks. He got a couple of Toy Story sets for his birthday in January, but he pretty much still brings me the pieces to build the set. 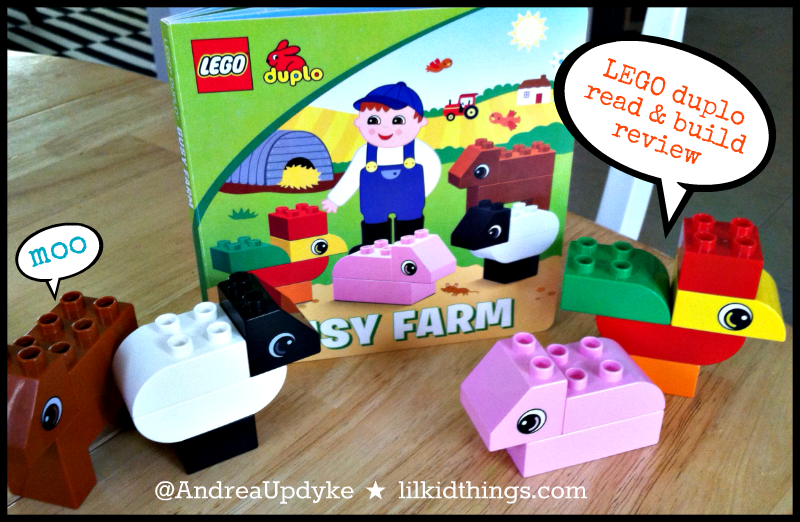 When I had the opportunity to review the new Busy Farm LEGO DUPLO Read & Build set ($12.95), I couldn’t wait. The day we got our set, Oscar could not wait to start playing with it. I made him wait until Daddy got home so we would have a cameraman to record the fun. Also, it was pretty adorably to watch him wiggle with anticipation. When we started in, Oscar was mesmerized by not just the blocks, but the fun story that goes along with them. We have now taken the animals apart and put them back together so many times now that he can do it completely by himself! The book is a simple rhyming story that fits the theme of the blocks, in our case the farm. Then the pages illustrate the item you will be building with the blocks where they should be, but separated so the child can see what each individual piece looks like. I did find that I was getting tongue-tied trying to identify the shapes for him to find. But then I was reminded that we are talking about Legos here! We just needed to find the one that “looks like the picture”. Honestly, I have Legos to thank for the successful assembly of 90% of the furniture in my home. So there’s that. Disclosure: Thanks to Lego and Babycenter for sponsoring this post and providing a play set for my family to review. All thoughts are my own. I love Duplos! Both my son and my daughter love playing with them. And for me, I love the 30 minutes of freedom they provide while my kids are busy! Ollie had a TON of Duplos…like three of those big bags that are longer than I am tall. Somehow we’re now down to a ragtag group of about ten. I suspect that had something to do with us moving. But out of all those Duplos, we never had were supposed to make anything. Ollie would be thrilled to have these. I saw these the other day and got SO excited. I can’t wait until my boy is old enough for these! He built a rooster and a pig! He built a rooster and a pig. A pig and a rooster. 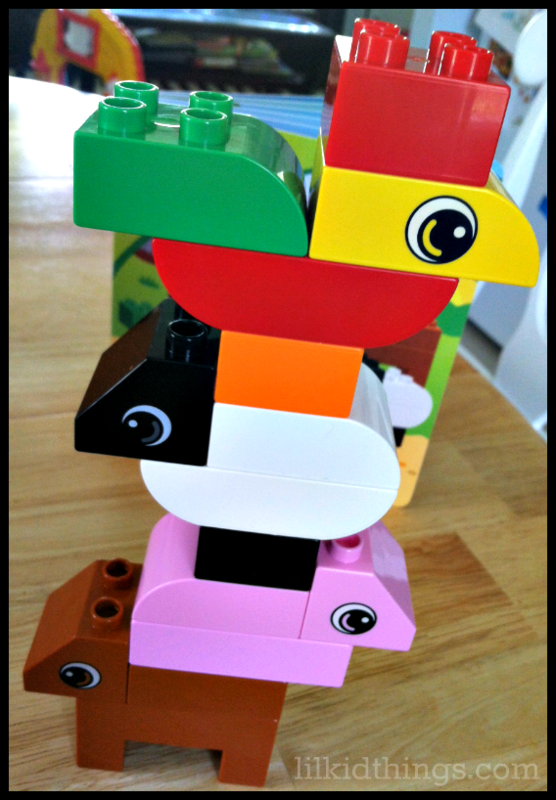 Oscar built a rooster and a pig. He built a rooster and a pig. How cute! Love these sets! thanks for your post! He built a rooster then a pig. a rooster and a pig! Super cute! A rooster and a pig! How fun! I am thinking these would be so awesome for my daughter Maybelle and help her stay out of her big brother’s big boy legos! I subscribed to your monthly newsletter. He built a rooster and a pig!! I know my almost 2 year old would love this! Oh the pig and rooster…how fun! A rooster and a pig! How sweet! He built the rooster and the perky pig! Oink oink! Rooster and pig! Oscar built a rooster and a pig in the video! He made a rooster and a pig. Looks like a lot of fun!! Thanks!! Love the video! My boys are HUGE Lego fans too! He built a rooster and a pig. I would love to have these! !